New Jersey is known for its sea scallops, lobsters, quahog clams, surf clams, oysters, mussels, blue crabs, and fresh fish. Species of fish landed in New Jersey often include fluke (summer flounder), winter flounder, yellowtail flounder, weakfish, black sea bass, tautog, scup, red hake, whiting, bluefish, striped bass, yellowfin tuna, mahi mahi, and other species. Recent advances in oyster and hard clam aquaculture have led to a successful shellfish aquaculture industry in state waters. New Jersey shellfish aquaculture operations include oyster and clam farms as well as commercial shellfish hatcheries. 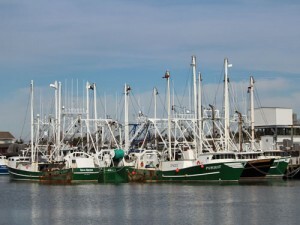 New Jersey fishermen land seafood at Atlantic City, Avalon, Barnegat Light, Belford, Belmar, Brielle, Cape May, Highlands, Newark, Point Pleasant, Port Norris, Toms River, Wildwood, and other ports.